Well, this is exactly what Governor Cuomo has done in New York with the release of the long awaited energy efficiency targets and New Efficiency New York plan (the plan). 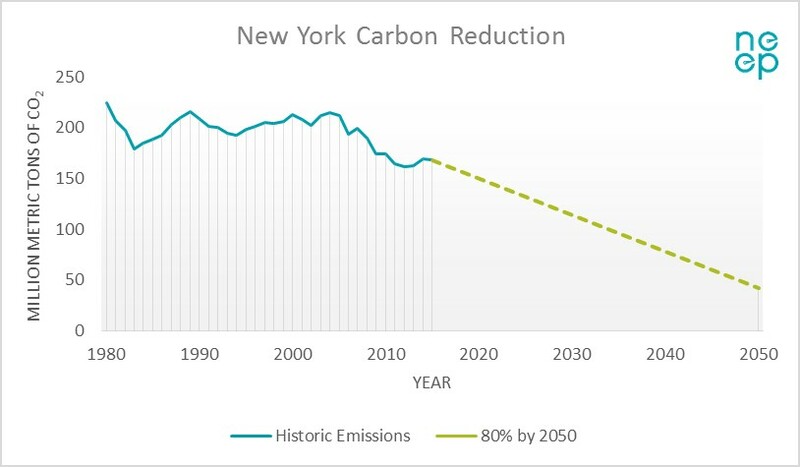 Energy efficiency is the cheapest way to reduce harmful carbon pollution emissions, which is critical for New York to reach its goal to achieve 80 percent carbon reduction by 2050. The targets set forth by Governor Cuomo call for the state to reduce its energy consumption by 185 trillion BTUs by 2025 compared to forecasts. It's an increase of about 50 percent over current goals where in 2016, New York achieved energy savings equal to 1.09 percent of annual utility electricity sales. "Energy efficiency is the most cost-effective way for New Yorkers to lower utility bills, curb harmful emissions and battle climate change," Governor Cuomo said. "As the federal government abdicates its responsibility to safeguard our environment, we must continue our bold action to reduce emissions and protect all New Yorkers, today and in the future, from the devastating effects of climate change." This recognition that energy efficiency is an essential mechanism to help states achieve significant carbon reduction - along with the strategies set forth in the plan - steer New York down the right path for strong energy efficiency initiatives and deep carbon reduction. With a fuel-neutral target instead of an electric-specific target, the state can implement strategies such as complete retrofit and weatherization programs. Focusing on all fuels enables the strategic electrification of building heating and cooling systems with the implementation of highly efficient air source heat pumps that reduce or eliminate the use of natural gas or oil to heat buildings. Strategies in the plan include utility action, market-enabling strategies, codes and standards, and advanced efficiency for deeper energy and carbon savings. NEEP identified building energy codes as a mechanism that could be leveraged in the energy efficiency target to help New York achieve carbon reduction with building codes that include strengthening amendments toward zero energy, solar-ready buildings, and standards that help accelerate electric vehicle deployment and carbon reduction. NEEP also identified stretch codes as an opportunity for communities to go beyond state building energy codes. With NYSERDA already developing stretch codes and New York City mandating the adoption of stretch codes in 2019, the plan recommends NYSERDA develop a new stretch code for each code cycle, and the state consider making the stretch code mandatory in the 2022 cycle. In addition, the integration of carbon focused metrics in the state code can help position the state to achieve the level of energy and carbon reduction necessary to reach state climate goals. The plan is chock full of recommendations on how to implement and ensure successful strategies in energy efficiency to achieve deep carbon reduction. Now it is time for the Public Service Commission (PSC) and NYSERDA to take action to implement these recommendations and ensure the plan is accomplished. While the PSC will have its work cut out for it in implementing the recommendations from the Governor’s plan, the commission has been taking action on various other proceedings. Under the Distributed System Implementation Plans and Reforming the Energy Vision proceedings, the PSC has issued an order adopting a whole building energy data aggregation standard. Enabling access to building energy data is a critically important aspect of managing building energy usage. While discussions of energy data access often raise valid privacy concerns in the multi-tenant market segment, providing building owners with aggregated and anonymized whole building energy usage data is becoming the accepted solution for these concerns. In order to alleviate concerns in such a scenario, most utilities offering aggregated and anonymized data require tenant consent if a building has: (1) a small number of tenants; and/or (2) no single tenant uses a significant proportion of the building’s energy. In New York, the commission adopted the 4/50 building data aggregation threshold proposed by the joint utilities. This requires the building to have four tenants, without a single unit accounting for 50 percent of the whole building energy consumption. The join utilities are required to file final terms and conditions for data access for the commission to consider. In addition to this, the commission has also adopted a Utility Energy Registry (UER). According to the order, the UER will be an online platform that will provide streamlined public access to aggregated community-scale utility energy data. The UER is intended to promote and facilitate community-based energy planning and energy use awareness and engagement. The utilities are required to upload the datasets every six months (January to June and July to December) within 30 days of the close of each semi-annual period to the UER. Taking steps to enable data access for whole building energy usage and creating a platform to provide public access to community-scale data will enable transparency as the state begins to implement the strategies that are outlined in the Governor’s New Efficiency New York Plan. With spring in full bloom, it will be exciting to see how these initiatives take fruit and blossom over the summer.